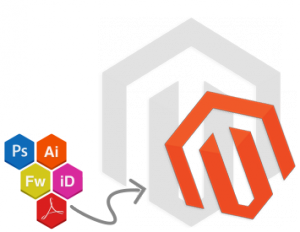 Get PSD / Sketch to Magento Theme Conversion at prices like never before! Appearance, and Presentability- with these the two crucial factors determining the successful traffic and subsequent sales conversions when it comes to any eCommerce solution, it is important that you choose the right eCommerce platform to promote your business. With about 25.6% of the eCommerce websites in the global scenario being powered by Magento, it’s safe to say that Magento towers over its competition, being the choice eCommerce platform for businesses of all sizes and capabilities. At HTMLSliceMate, with a host of advantages such as Realistic and original design with pixel-perfect conversions, Comprehensive cross-browser and cross-device compatibility , manual coding to address each aspect and functionality exquisitely, appropriately commented mark-ups and well laid structure and more, you’re guaranteed 100% satisfaction for your PSD to Responsive Magento conversions. Can I have my HTML site converted to Magento? Can I customize an existing Magento powered website? Yes you can- HTMLSliceMate can make just about any customisation on your existing Magento site as you’d like, just get in touch with our team on mail@htmlslicemate.com, or drop us a ping on the live chat and we’ll gladly assist you with it.